Create your team of four or more members and start the challenge. Create a team, recruit members, and start fundraising today! 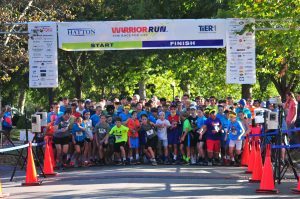 The Warrior Run is excited to offer this unique opportunity for you and your team to raise funding for mental health programming in their school! The Warrior Run: The Race for Life, an event featuring a 5K race and one-mile walk, will be held Saturday, October 6, 2018 at 5:15 p.m. Kid’s Fun Run starts at approximately 7 p.m. The race starts at the Bell Tower Park off of Pleasant Street and runs through beautiful tree-lined Mariemont. It ends back at the Bell Tower with a night of food, drinks, music and games for the family. Jim Miller Memorial Mile is an untimed 1 mile walk through Mariemont. Interested in becoming a Sponsor? Please click the link below for more information. View photos of Warrior Run over the years from 2010 to present. Welcome to The Warrior Run! The Warrior Run:The Race for Life, an event featuring a 5K race, and one-mile walk will be held Saturday, October 6, 2018, 1M at 5:15 p.m., 5K at 5:30 p.m. Both courses start and finish at the Bell Tower @ Dogwood Park, off Pleasant Street, in the historic Village of Mariemont,Ohio. Kid’s Fun Run starting at 7 pm. The family-oriented fundraiser benefits Cincinnati Children’s Hospital Medical Center’s (CCHMC) Surviving the Teens® program plus local in-school mental health programs. Make it a night—enjoy a beautiful setting, a scenic run/walk through Mariemont, great food, music, carnival-style kids games and a movie at dark. Don’t miss the fun! Helps individuals in suicidal crisis within the United States to contact the nearest available suicide prevention and mental health service provider. A brief overview of the statistics on depression and suicide with information on depression treatments and suicide prevention. he suicide prevention webpage of the Centers for Disease Control and Prevention (CDC) includes a variety of data, reports, awareness materials. Aims to prevent suicide through public awareness and education, and features information, news, and resources. The Division of Psychiatry at Cincinnati Children’s created the Surviving the Teens / Suicide Prevention Program to provide information, resources and support. Information on government suicide prevention efforts, news, events and links to important prevention publications.